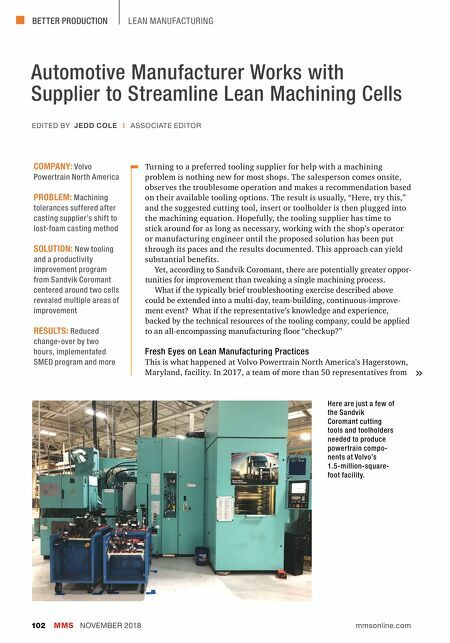 BETTER PRODUCTION MMS NOVEMBER 2018 102 mmsonline.com LE AN MANUFACTURING Automotive Manufacturer Works with Supplier to Streamline Lean Machining Cells Turning to a preferred tooling supplier for help with a machining problem is nothing new for most shops. The salesperson comes onsite, observes the troublesome operation and makes a recommendation based on their available tooling options. The result is usually, "Here, try this," and the suggested cutting tool, insert or toolholder is then plugged into the machining equation. 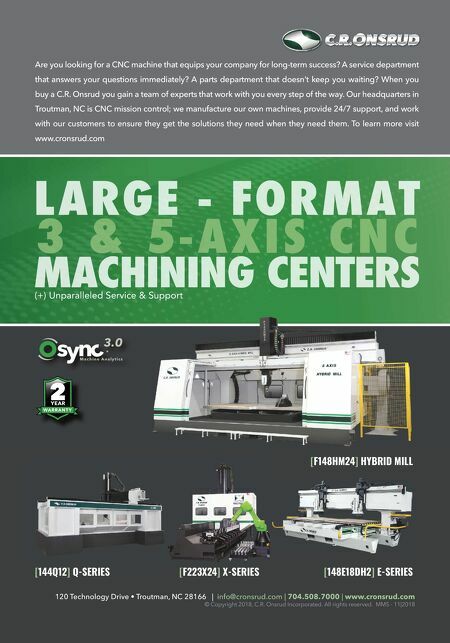 Hopefully, the tooling supplier has time to stick around for as long as necessary, working with the shop's operator or manufacturing engineer until the proposed solution has been put through its paces and the results documented. This approach can yield substantial benefits. Yet, according to Sandvik Coromant, there are potentially greater oppor- tunities for improvement than tweaking a single machining process. What if the typically brief troubleshooting exercise described above could be extended into a multi-day, team-building, continuous-improve- ment event? What if the representative's knowledge and experience, backed by the technical resources of the tooling company, could be applied to an all-encompassing manufacturing floor "checkup?" Fresh Eyes on Lean Manufacturing Practices This is what happened at Volvo Powertrain North America's Hagerstown, Maryland, facility. In 2017, a team of more than 50 representatives from COMPANY: Volvo Powertrain North America PROBLEM: Machining tolerances suffered after casting supplier's shift to lost-foam casting method SOLUTION: New tooling and a productivity improvement program from Sandvik Coromant centered around two cells revealed multiple areas of improvement RESULTS: Reduced change-over by two hours, implementated SMED program and more EDITED BY JEDD COLE | ASSOCIATE EDITOR Here are just a few of the Sandvik Coromant cutting tools and toolholders needed to produce powertrain compo- nents at Volvo's 1.5-million-square- foot facility.